The iPro2 .4G is a highly integrated multichannel RF transceiver designed for low-power wireless applications in the 2.4G Hz Industrial Scientific Medical (ISM) band. •	Very small footprint. The iPro2.4G comes in a 17 x 17 mm, 8 pin through hole and SMD postcard pin out. 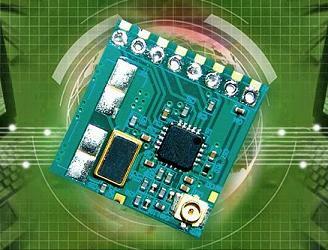 •	iPro2.4G has many powerful digital features allow building a high-performance RF system using an inexpensive microcontroller. 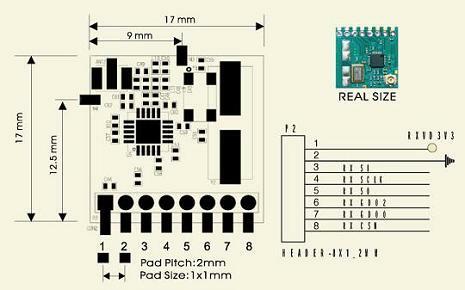 •	Wake-on-radio functionality for automatic low-power RX polling. •	Very low power consumption RX: 13.3mA, TX: 21.2mA @ 0dBm output power. •	Burst mode data transmission with high over-the-air data reduces current consumption. •	Fast start-up times reduces average current consumption. Excellent radio Performance. •	High sensitivity (-101 dBm @ 10 kbps). •	Programmable data rate from 1.2 – 500 kbps. •	Robust solution with excellent selectivity and blocking performance. Programmable output power up to +1 dBm. •	Ideal for multichannel operation (50-800 kHz channels). •	Full packet handling including preamble generation, sync word insertion/detection, address check, flexible packet length and automatic CRC. •	Programmable Carrier Sense indicator and digital RSSI output enables adaptive channel selection with increased robustness of the communication link. Copyright © 2007 iPro Technology Inc. All rights reserved.